1/4 cup Splenda Granulated (the kind that measures cup for cup in place of white sugar). 1/4 cup Brown Sugar Blend Splenda (1/4 cup equals sweetness of 1/2 cup of regular brown sugar). 1/4 cup brown sugar (I use real sugar, for texture). Preheat oven to 375 degrees F (190 degrees C). Grease or line 12 cup muffin pan. In a large bowl, mix together the flour, white and brown sugars, salt, and baking powder. Stir in applesauce, eggs, almond extract, and milk until well blended and very few lumps remain. Gently fold in blueberries being careful not to mash them. For the crumb topping, mix together the flour, softened butter, spice, oats, and brown sugar. Place a small amount on top of each muffin. This post is from my Mother's Day repertoire, but any day can be Mother's Day when you make these muffins. Even if you omit the crumble topping, the blueberry packed goodness will be hard to resist by even your pickiest eaters. *Inspired by All Recipes.com. Visit the All Recipes site to see what you would need for original recipe. I have tweaked these muffins with Splenda and applesauce substitutions. Also changed the flavour profile by adding almond extract to account for using less sugar and oil. 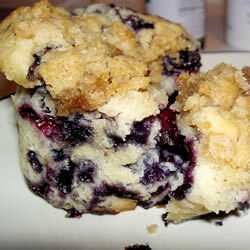 **Credit for Blueberry Muffin Image. They sound absolutely scrumptious! Wish I had one right now! These Blueberry muffins look delicious. I will have to make them and let you know how they came out. Thanks for stopping by my blog. Enjoy your day.